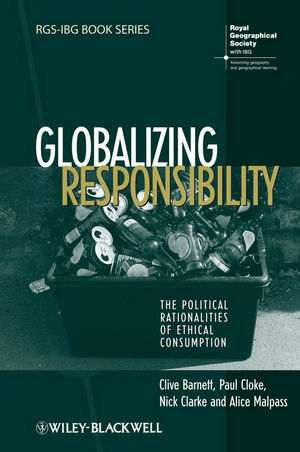 Globalizing Responsibility: The Political Rationalities of Ethical Consumption presents an innovative reinterpretation of the forces that have shaped the remarkable growth of ethical consumption. Clive Barnett is Reader in Human Geography, Faculty of Social Sciences, The Open University. Paul Cloke is Professor of Human Geography, Department of Geography, University of Exeter. Nick Clarke is Lecturer in Human Geography, Department of Geography, University of Southampton. Alice Malpass is Research Associate, Primary Health Care, University of Bristol. 1 Introduction: Politicizing Consumption in an Unequal World. 1.1 The Moralization of Consumption. 1.2 Justice, Responsibility and the Politics of Consumption. 1.3 Relocating Agency in Ethical Consumption. Part One Theorizing Consumption Differently. 2 The Ethical Problematization of 'The Consumer'. 2.1 Teleologies of Consumerism and Individualization. 2.2 Theorizing Consumers as Political Subjects. 2.3 The Responsibilization of the Consumer. 2.4 What Type of Subject Is 'The Consumer'? 2.5 Does Governing Consumption Involve Governing the Consumer? 2.6 The Ethical Problematization of the Consumer. 3.1 The Antinomies of Consumer Choice. 4.1 Consumer Choice and Citizenly Acts. 4.2 Articulating Consumption and the Consumer. 4.3 Mobilizing the Ethical Consumer. 4.4 Articulating the Ethical Consumer. Part Two Doing Consumption Differently. 5.2 Researching the (Ir)responsible Consumer. 6 Local Networks of Global Feeling. 6.1 Locating the Fair Trade Consumer. 6.2 Re-evaluating Fair Trade Consumption. 6.3 Managing Fair Trade, Mobilizing Networks. 6.4 Doing Fair Trade: Buying, Giving, Campaigning. 7.1 Rethinking the Spatialities of Fair Trade. 7.2 Re-imagining Bristol: From Slave Trade to Fair Trade. 7.3 Putting Fair Trade in Place. 7.4 Fair Trade and 'The Politics of Place Beyond Place'. 8 Conclusion: Doing Politics in an Ethical Register.